Appetizers and water upon arrival, personal friendly service, and breakfast was fantastic! Cannot day enough about how wonderful the staff is here. Lamprini made us feel like this was our home. The location was picture perfect and everything was like a dream. Walking distance to Akrotiri village. Cannot recommend highly enough! This was a dream come true vacation and staying at our villa really made it so. Upon arrival, were greeted and treated like family which continued until our departure. Lamprini will spoil you and your family! She arranged for transportation, dinner recommendations, and excursions that did not disappoint. 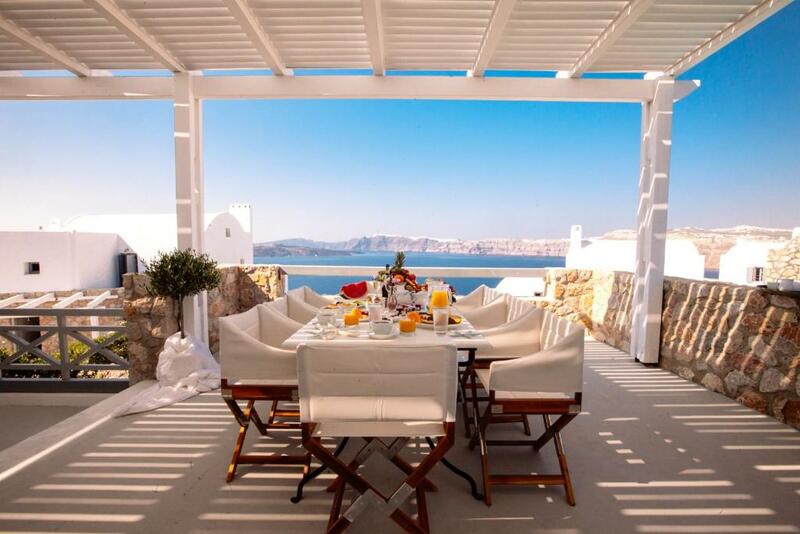 Our daily breakfasts on our veranda overlooking the caldera were exceptional. The accommodations for 8 of us were excellent and we were very comfortable. The staff are professional and the maid service was fabulous as well. The pool was vacuumed and skimmed and the patio flooring mopped before 7 am everyday. We also enjoyed the quaint town of akrotiri - which was a 5 minute walk away. We would stay again! We were welcomed to this gorgeous villa as though we were family returning home. Lamprini went above and beyond to help arrange a birthday surprise for my husband, a sunset sailing cruise, dinner reservations, delicious breakfasts, and much more. 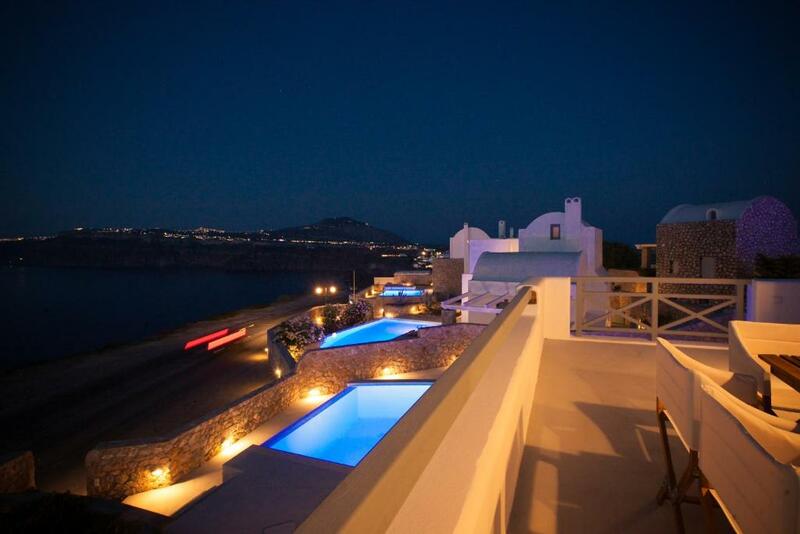 Adelante 88 is definitely the best place to stay in Santorini! The property and location were amazing, but the wonderful staff is what makes this place a must stay! The service was beyond excellent. The owner and the staff were polite, hospitable and catered to all our needs. They provided recommendations on things to do, places to eat at and even helped plan our days. All of their recommendations were excellent and we had a fabulous trip. We stayed for a week - Mr. Panos and his team absolutely incredible!!! We loved everything - superview, super service. “Everything you need when you need it”. And our special regards to Lamprini - thank you, Dear Lamprini! ))) Alexey and Marina. Breackfast was great, hospitality as well and view awesome. Lock in a great price for Adelante 88 Villas – rated 9.8 by recent guests! Adelante 88 is wisely positioned on the top of the Caldera at Akrotiri with unlimited panoramic views of the volcano and the whole length of the Caldera. You can find Red beach in a short distance from the property. Free WiFi is offered throughout the property. 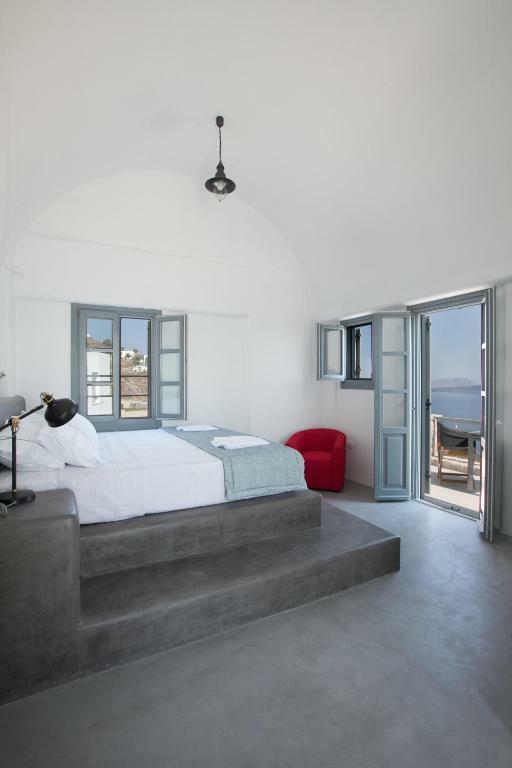 The property consists of autonomous private villas that combine ornately the bright Aegean tradition along with the Cycladic art. 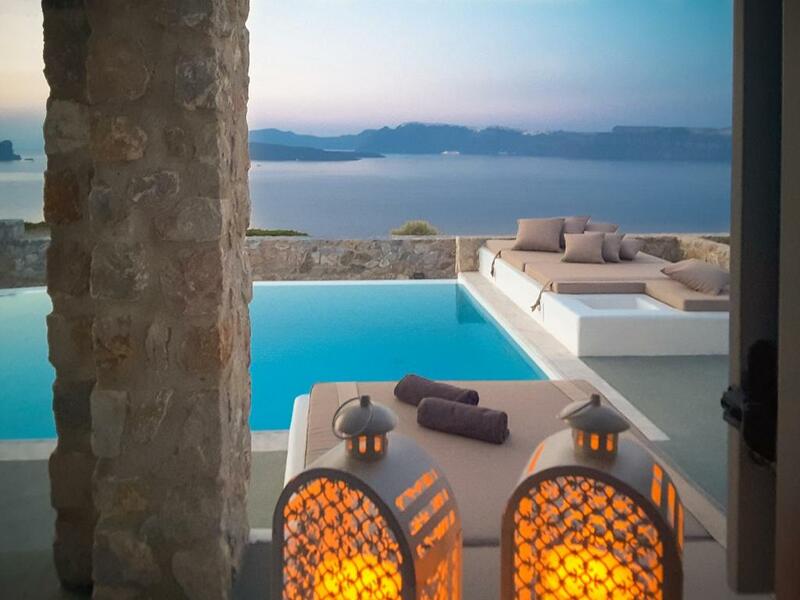 Each villa includes a private pool. Free private parking is available at the aparthotel. Archaeological Site of Akrotiri is 0.7 mi from Adelante 88. 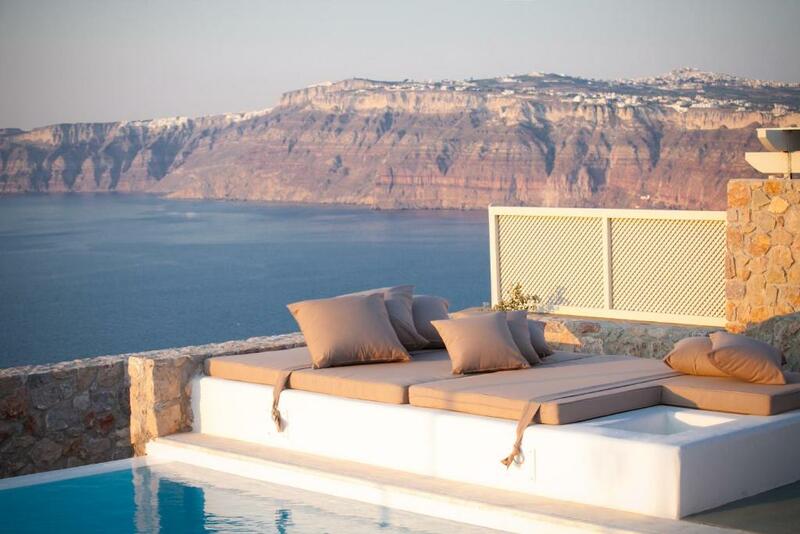 The nearest airport is Santorini (Thira) Airport, 5 mi from Adelante 88. This property also has one of the top-rated locations in Akrotiri! Guests are happier about it compared to other properties in the area. When would you like to stay at Adelante 88 Villas? This villa has a balcony, air conditioning and soundproofing. This villa features a balcony, air conditioning and dining area. This villa has a balcony, flat-screen TV and mini-bar. House Rules Adelante 88 Villas takes special requests – add in the next step! Adelante 88 Villas accepts these cards and reserves the right to temporarily hold an amount prior to arrival. The weather. It was cooler than expected and hence we could not use the pool at the villa. No heater in the pool but I am told that the cool weather was a shift from last year. There is truly nothing bad to say everything was amazing. Everything was perfect. Be aware their shuttle service needs payment in cash. The entire experience was great!. The view, the villa itself, the food, the service, but mostly Lamprini, our host! Lamprini does not just go the extra mile - she does so smiling, and always wondering what other magic she can make happen. Forgot your bikini? Lamprini will find you a beautiful one that fits perfectly. Want to set up a surprise trip? Lamprini will provide you with recommendations, book it and press the third party to treat you like a superstar al - all whilst keeping it a secret from the rest pf your group. Whether it was drinks, food, restaurant reservations, tips, trips, or just a good laugh Lamprini truly added to the already wonderful location. The villa itself was incredibly spacious, cool (temperature wise) and nicely decorated. It was kept immaculate by the friendly staff (as well as the private pool). The bedrooms are quite large and all have unique identifying features and a fully decked-out bathroom. The breakfasts were served on our private patio (great omelettes!!) and was made to our daily order, really lovely. Also, directly next to the pool was a huge sun-bed-like construction, really comfy and could easily fit 8 (we were just the four of us), with extra loose pillows. It really defeats all other pool goals.... The view on the Caldera was incredibly beautiful. And that was not just our opinion as we could spot at least 10 people daily taking pictures along the way from our villa. All in all in the my top 3 holidays ever. Upon arrival at the hotel you felt like you were part of the family. We were greeted at reception by Lamprini, one of the friendliest people I have ever met. We were given a small snack of delicious traditional bread, olives and red sauce and had a taste test of a local wine. All this over filling in our details! We were also given a detailed run down of the many different tours and activities that we could book whilst at the hotel. Lamprini then showed us to our villa (Porto Castella) and gave us an in depth tour, ensuring that we knew how to operate everything, including the air conditioning, TV and the various door and window shutters. The owner, Mr Panos, also stopped by to welcome us to his property and he made us feel right at home. The villa looks exactly as it does in the website photos and is beyond amazing. It is spacious and comfortable, with generous sized bathrooms and comfortable king sized beds. The WiFi is speedy and reliable. There were many options on the breakfast menu and it was delivered to us to enjoy outside by the pool. We spent the days relaxing on the daybed and going for swims when it got too hot. The villa is next to a road but the rock wall provides the necessary privacy. 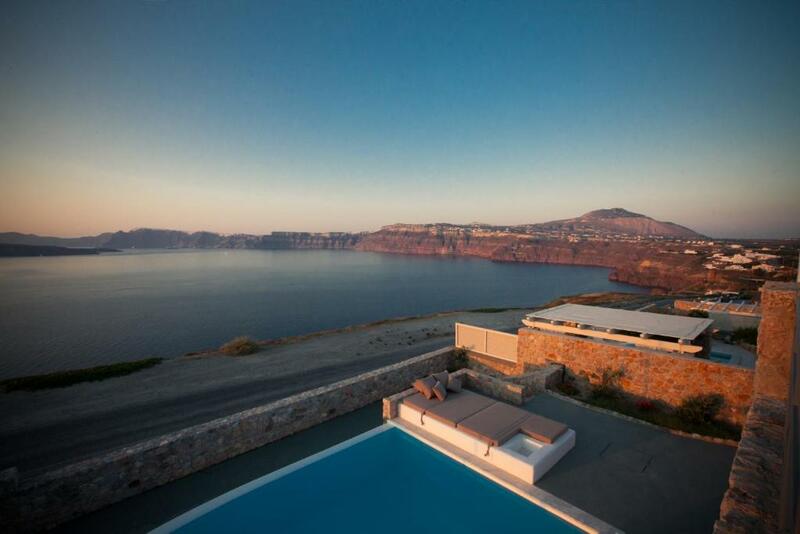 The villa is also in a great location to enjoy the sunset behind the south west headland of Santorini island. We bumped into Mr Panos and Lamprini a few times and they were quick to check that we were enjoying our stay and ask if there was anything more they could do. We wouldn’t hesitate to book this property again. If we could rate this property higher than 10/10 we would. It has breathtaking views (just outside is a viewpoint that people stop at to take pictures). Every amenity is available (excellent hair dryer, we asked for an iron and it arrived immediately with an ironing board, a basket of fruit welcoming us, etc.). You feel like you are the only ones there as staff are very attentive and warm (when we were leaving, the owner personally came to thank us and say goodbye). Staff recommended an amazing wine tour that went beyond our expectations, and a restaurant for dinner complete with a driver to take us there and back. The breakfast is incredible, with lots of very fresh choices (you check off what you would like and it is all set up for you in the morning). Our only regret is that we could not stay there longer! The villa was wonderful and the views were stunning but the best part of the holiday was the warm welcome from Mr Bavros and Lambrini. They were full of wonderful suggestions and nothing was too much for them - even helping us out after we had checked out. Highly recommend it. Lovely hosts, location was amazing with a surreal view. Breakfast was great too!